547 Park Road Popping Up | Park View, D.C. If you’ve been down Park Road lately, you may have noticed that 547 Park Road is popping up. From a building permit issued on December 14, 2016, (B1605146), the third floor addition over the existing footprint was approved, including full Structural and MEP. The building will also change its use from a single family dwelling to two family flat. This project was approved as a matter-of-right, meaning the permit did not require ANC review of Board of Zoning Adjustment approval. In this case, the building can be no more than two units or more than 35 ft. in height. In the coming years, the 500-600 block of Park Road appears to be headed for significant changes. 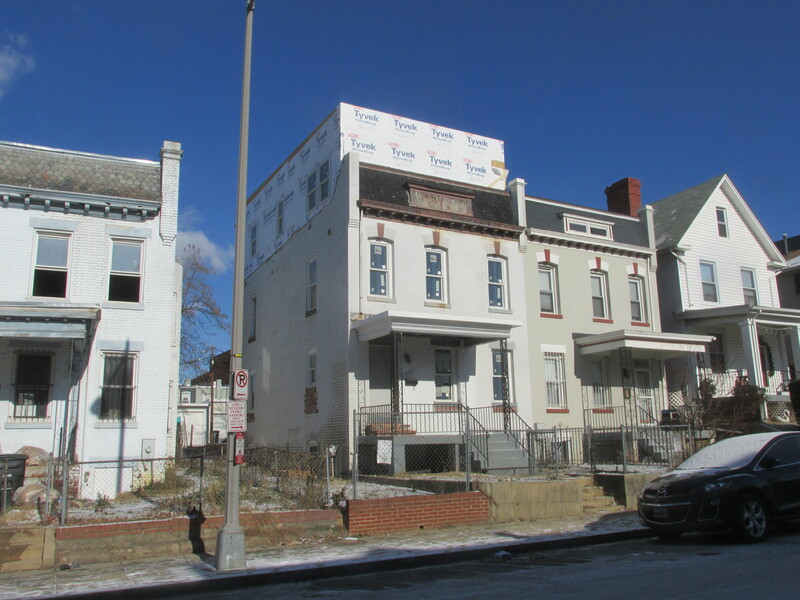 While the most significant change will be the redevelopment of Park Morton on the south side of the street, the owner of 503 Park Road submitted an application to raze the house there on December 13th, 549 Park Road sought approval to convert that building into a 3-unit building at the beginning of 2016, and the apartment building at 525 Park Road is in the midst of being redeveloped into a building that has larger apartments units. This entry was posted on January 9, 2017 at 7:01 am and is filed under Development, Housing. You can subscribe via RSS 2.0 feed to this post's comments. Great! A welcome improvement to the neighborhood!